The 2019 Acura ILX has been revealed, closing the loop on the premium automaker’s range of cars and SUVs with the latest design language and active safety tech. 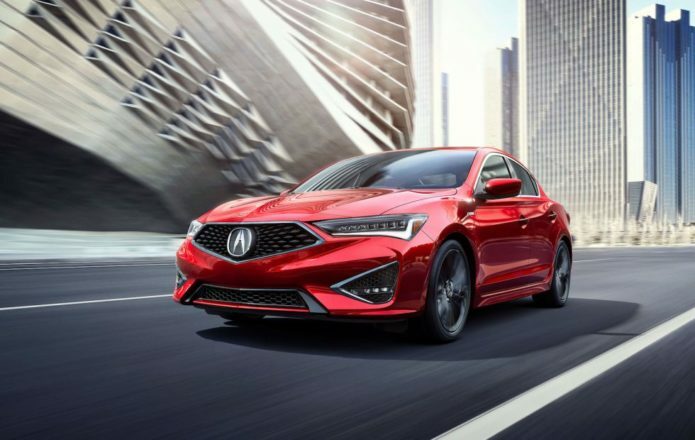 The refreshed 2019 ILX most notably adopts the new Acura snout, the Diamond Pentagon Grille, which we first saw previewed on the Acura Precision Concept. After that, it spread across the automaker’s SUV and sedan line-up, an altogether more striking fascia than the “beak” of before. It’s not the only aesthetic change for the 2019 model year, mind. Indeed, Acura says that the updated ILX is new from the A-pillars forward. That means a whole new hood, now with more sculpted lines, and 7-element Acura Jewel Eye LED headlamps. At the rear, too, there are new styling details. The 2019 ILX gets a new deckled, fascia, and lower diffuser, while the taillights are now LED. There’s an exposed exhaust, too, and new wheel options including 17-inch split-5 spoke alloys and an 18-inch wheel exclusive to the A-Spec. It’s not the only differentiation to the new ILX A-Spec. Available with the Premium and Technology Packages, the A-Spec car gets dark chrome trim for the front grille and lower fascia, along with dark appearance headlamps and taillamps. There’s a gloss-black decklid spoiler, and LED fog lamps. Apex Blue Pearl paint will be an ILX A-Spec exclusive. Inside, the A-Spec trim gets a graphite-silver dash accent with chrome inserts. The steering wheel has A-Spec badging along with contrast stitching, and there are aluminum sport pedals. The sport seats, themselves a new design, get either Ebony or Red leather finish, with black Ultrasuede center panels and high contrast stitching. The regular 2019 ILX gets an updated interior, too. The sport seats are reshaped and restyled, front and back, with high-contrast piping and stitching available. Power-adjustable driver’s seat lumbar is now standard, as is a silver-finished dash trim with chrome inserts and a machine-finished push-button start. Maybe more important is the tech upgrade, which affects both safety and infotainment. AcuraWatch, the automaker’s suite of adaptive cruise control, forward collision warnings, lane keeping assist, collision mitigation braking, and road departure mitigation with lane departure warning, is now standard across all ILX models. Blind-spot information and rear cross traffic monitor remain standard. As for the infotainment, a refreshed dual-screen On Demand Multi-Use Display system is now available. That has both Apple CarPlay and Android Auto, and promises to be around 30-percent faster than the old system. A 7-inch capacitive touchscreen is now more reactive than the old system, too. Acura says that the 2019 ILX will start showing up in dealerships this October. Pricing has not been confirmed at this stage, though the 2018 ILX starts at $28,100.